I can't get enough of these guys!!! 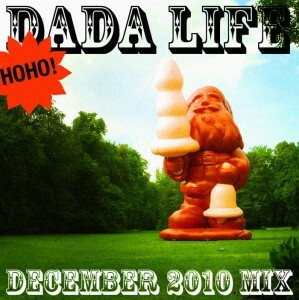 Dada Life finally dropped their December mix this past week. 45 minutes of non stop wreckage!!!! This mix is an excellent blend of some today's hottest and filthiest songs as well as throwing in some of their current remixes and personal projects. Jaw-dropping b33ts coming at you 500 miles per hour O_O ! HOLY FVCK! I CAN'T DESCRIBE HOW HARD THIS MIX SLAPS!! IMAGINE GETTING HIT IN THE FACE WITH A SHOVEL THEN ONCE YOU HIT THE GROUND SOMEONE WITH A STEEL TOED-BOOT KICKS YOU IN YOUR TEETH SOCCER-BALL-STYLE. 2 FVKCING WEEKS TIL I WITNESS THE CARNAGE LIVE, DADA STYLE!!!!!!!!!!!!! #1 on my Christmas list.